You don't always like to show it, but deep down, you're a romantic. Born out of the blog by the same name, the book's the creation of Glen Ellyn–born Jason Bitner, who delves into the world of aural love letters, harkening back to a time when someone spent hours methodically bringing together The Cure and Cole Porter—which, of course, was a secret message only you would understand. 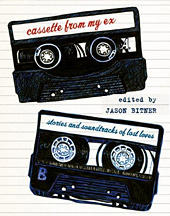 Along with the glitter-pen-written liner notes, you'll read recollections of esteemed writers (The New Yorker's Ben Greenman; Rolling Stone's Rob Sheffield, The Ice Storm's Rick Moody) recalling their tragic teenage stories. Like this one: "I was an Asian guy with long hair who was into Heavy Metal; she was a Latvian dancer who liked to chain-smoke Camels." (That old story.) Or the time "Long ago, in a city I will not name, I loved a woman, and she punished me for it." Sounds like someone got Manilow: The Mandy Mix.